MRI Consultants has provided 3T (tesla) state of the art MRI for 7 years now. Most doctors are unaware of 3T’s superior imaging which can make a huge difference to your care. Basically 3T MRI improves all MRI images because the scanner has twice the signal to noise of a 1.5T scanner and 10 times the signal to noise of a 0.3T OPEN MRI. We are the only MRI specialists with two 3T MRI scanners. If a doctor asked me for real world differences between scanning at 1.5T and 3T, I would say, it is diagnostic certainty. All radiology studies show that 3T MRI is better. The extra detail and speed gives us a more definitive picture. It shows more lesions in almost any brain abnormality. It especially helps MRA (angiography) studies. The 32-channel head coil in our Lewes office, combined with 3T magnet strength, generates the finest MRI brain scans in Delaware. Just to compare to a 1.5T scanner for MS—we do a sagittal FLAIR image which has 20 images (with a 50% gap) in 4 min. On our 3T scanner in Newark we do a 128 slice 1mm contiguous study—or 6 times more images in 7 min. On our Lewes scanner we do 448 images (20 times more pictures) with 0.6mm overlapping slices in 4 minutes. It is the remarkable 32 channels (*the best technology currently available) that speeds things up. 3T is crucial for accurate evaluation of MS. And, it does not cost any more. Additionally, we also use the safest MR contrast (Prohance) which does not have any incidence of NSF (*nephrogenic systemic fibrosis—a very rare, and incurable, side effect). The 32 channels also let us do remarkable studies like susceptibility weighted images (SWI)—which show microscopic hemorrhage (in 6 min) and super high resolution MR angiography in only 4 min. We have learned that MANY brain pathologies involve microscopic hemorrhage. This can completely alter stroke or tumor care. 32 channels allow diffusion tensor imaging in as little as 2 min, which shows the subtle changes in brain trauma or a NEUROQUANT study in 10 min. It was shown (by NYU radiologists) that a quantitative MRI shows the effects of a single blow to the head one year later. An MRA of the head takes only 4 minutes. Our facility in Lewes offers proton spectroscopy—a revolutionary chemical biopsy of tissue done with 3T MRI. In older patients, this is a free test for evaluation of Alzheimer’s disease versus multi infarct dementia. Basically, it can tell us if a patient has Alzheimer’s dementia and how much it has progressed. It can be used to monitor the disease over time. It is EXTREMELY useful. This is an important thing for most patients over 65 and in some patients’ families it is a good baseline and monitors for early onset of Alzheimer’s. It costs nothing more when added to a routine contrast MRI exam. It can show the difference between a stroke and a possible tumor or metastasis. Proton spectroscopy is also good for evaluation of prostate and breast cancer. It is free when added to a contrast MRI study. It can guide a biopsy or make a biopsy safer by telling us if the lesion we wish to biopsy is cancerous. With prostate cancer we also do a DTI study of the prostate in addition to the MRSI (two dimensional) proton spectroscopy. The DTI study provides apparent diffusion coefficient values which can be directly correlated to the Gleason stage of the prostate cancer. This additional information helps guide the urologist where to biopsy the prostate gland. 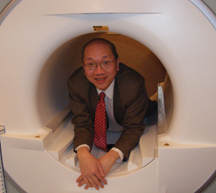 MRI Consultants offers the best technology in MRI in Delaware. Even our “open” MRI is an 18-channel 1.5T MRI scanner! (Ask your MRI provider how many channels his closed magnet has). Because of its 100% sensitivity to Breast Cancer, we prefer to do our Breast MRI’s on our 3T MRI, but for someone who either will not fit, or who is extremely claustrophobic, our 18-channel 1.5T OPEN BORE MRI is a good alternative. Getting a bad MRI costs no less then getting the very Best MRI possible … except for the time it will take you to repeat an inferior study. By having a better MRI study you get a more accurate diagnosis. Ask questions. Get the best. We also have 29 years experience doing MRI procedures.